Careful with those, you don't want to cut yourself. 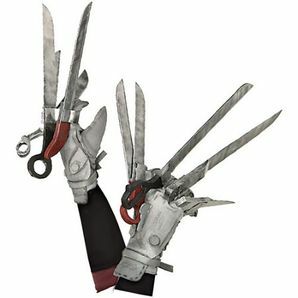 The Edward's scissorhands is a handy (hehe) tool for those who have no time to reach deep inside their pockets. Equipped with scissors, many types of knife, keys, lockpicks, Q tips, nail cutter, and hole puncher. Comes with plug-and-play system to allow the tools to be changed quickly mid-battle. Additional tools sold separately. This pair of gloves allow heroes to fight well in battle while maintaining their edgy gothic style. Perfect equipment to be used during your visit at Necrocomic Con. Store items in dry area. Prolonged contact with water may cause rust to appear. Please refer to user manual to change the tools. This page was last edited on 13 February 2019, at 13:31.